It was double-disappointment for Leighton Buzard on Saturday as they were narrowly beaten by Lutterworth, but also missed out on a bonus point in doing so. Leighton’s 28-20 defeat mean they remain 10th in Midlands 1 East behind next weekend’s opponents Market Rasen & Louth. The close scoreline looked a long way off at one stage though, and only a spirited comeback from the visitors made it look like a contest in the closing moments. Leighton won the toss and found it difficult to retain possession in the early stages against a strong running Lutterworth team. After 11 minutes the home side no.8 breached the Buzzards defensive line and off-loaded for the centre to score to give the home side an early 7-0 lead. Despite falling behind, the Buzzards were slowly gaining more possession and missed the opportunity to pull three points back when an Ollie Taylor penalty drifted wide. It was from a further Buzzard attack after 30 minutes that Lutterworth scored their second try – once possession was turned over, the home side kicked from deep in their own half – the ball was allowed to bounce on half way and fell conveniently for the chasing player to collect and run clear to score under the posts to extend the lead to 14 points. Leighton responded quickly to this setback. The forwards produced a number of driving mauls threatening the Lutterworth line and finally the ball was spread wide for centre Mike Robert to score in the corner. The difficult conversion was missed, but Ollie Taylor kicked a penalty with the last play of the half to make the half time score 14-8. It was only five minutes into the second half when the home side extended their lead with a fine try. Passing quickly through many pairs of hands and with clever offloads, Lutterworth scored which , with the conversion, left Buzzards trailing 21-8. 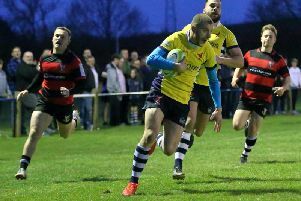 However the Buzzard forwards were increasing their influence on the game and, following a period of pressure, Ryan Fraser was driven over leaving Leighton Buzzard trailing 21-13 with 25 minutes left. Ten minutes later the Buzzard pack was again camped in the Lutterworth 22. However in a decisive moment the ball was lost in contact two metres from the line, the home side cleared, won the resulting lineout and moved the ball quickly to score a further converted try. From being close to reducing the lead to a single point, Leighton were now 28-13 behind. With last week’s comeback fresh in their minds, Leighton’s spirit was unbowed – an excellent break by full back Ben Beaumont, taken up by captain Euan Irwin was moved through numerous hands for Ryan Fraser to score his second try. With Geoff Branwhite’s conversion, Buzzard’s trailed 28-20 with ten minutes left. Knowing that bonus points were available for losing by 7 points or less and for four tries, Leighton pushed forward and were within two metres when the final whistle went. Despite a spirited performance Buzzards returned empty handed but remain 10th in the league. Next week they entertain Market Rasen & Louth at Wright’s Meadow, keen to regain ninth spot.